Bliss Cabinets Offers RTA Cabinets 40%-70% Cheaper Than Retail Stores, Shop Now! Get 5% Off 5 Styles + 5% Donated to Building Homes with code heroes at checkout. Pick Any Two Sample Doors For Free, $50 Value. Use Discount Code sample At Checkout. Get free 3D design and free samples. Hurry Up! Bliss Cabinets sells a variety of RTA kitchen cabinets and bathroom vanities at internet best pricing. The RTA industry is a $6 billion dollar industry and growing exponentially yearly. The quality of cabinets always rival the custom cabinet manufacturers. Standard features on cabinets include hardwood doors, hardwood face frames, 1/2" plywood boxes with matching exterior side panels, 3/4" shelving, dovetail drawer boxes. Their production managers and designers have over 30 years of combined experience in kitchen/bath design. The Bliss Cabinet design team uses state of the art software and provide each customer with numerous 2D & 3D renderings. Additionally, they will make unlimited changes until each customer is 100% satisfied with the layout. 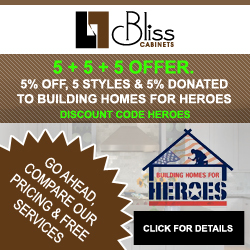 Found a coupon for Bliss Cabinets?